For the 17th year, Frederick County Humane Society will be hosting it’s annual Walk-n-Wag in Baker Park, Frederick. For the seventh year we will be participating in this special event! This is one of our favorite events!! This is a major fund raiser for FCHS. There will be lots of vendors, rescue groups, informational programs and lots of activities for you and your dog. We encourage all of our adopters to register for this event and come out and have fun! We will have three available greyhounds to meet; all are looking for their forever homes. 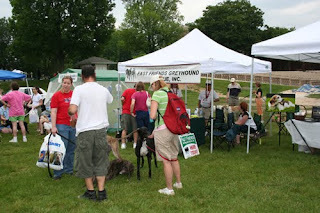 Come out and visit us and our hounds. Let us tell you about greyhounds and what great pets they make.For more information and to register, click on the title of this post. See you there!